In an effort to get children to eat something green (haha! ), I thought I’d try this Dr. Seuss connection. While it didn’t work for the kids, (yuck!) it did work deliciously for the adults (yum!). Sunny Side Up, Over Easy, or Fried Eggs: Fry an egg in the pan with olive oil and salt until done to your liking. Toast the english muffin, bread, or polenta slice. 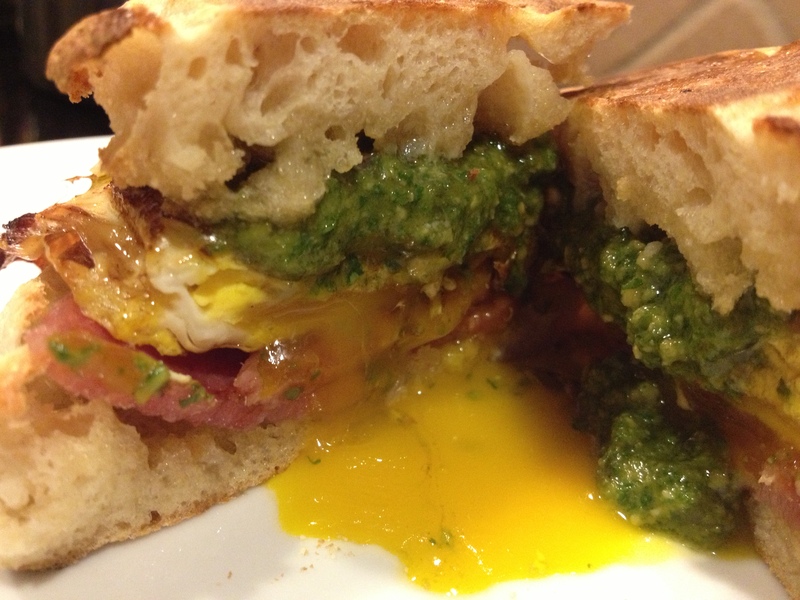 Add the ham or prosciutto on top, followed by the egg, and top with the pesto. Scrambled Eggs: Scramble an egg with pesto and fry in a pan until done to your liking. 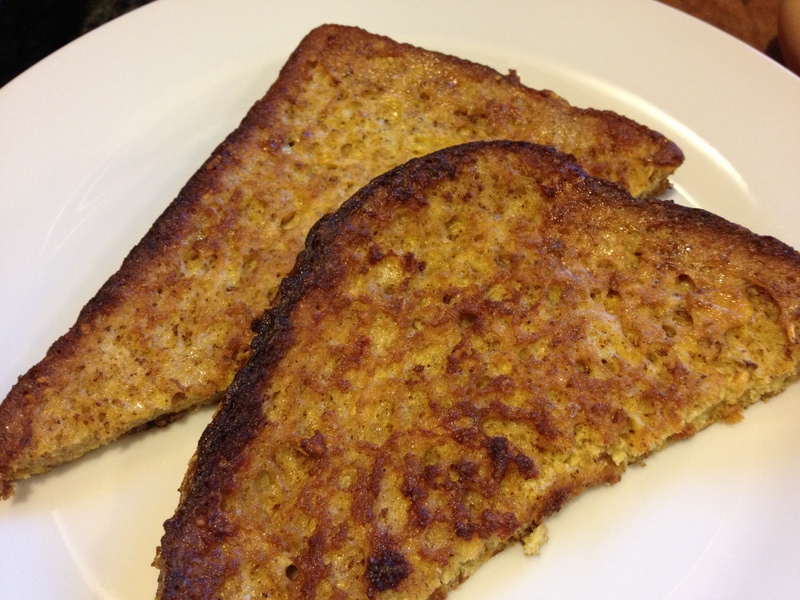 Place atop the toast along with the meat or serve separately. Below is a photo of an over easy version, which I like best because the basil retains its bright green color and contrasts beautifully with the golden egg yolk. A breakfast classic! This is by far the most requested breakfast item in our house. The children love the flavor and mommy loves that it is a way to regularly enjoy our hen’s bounty whilst frugally reclaiming stale bread that would otherwise be thrown away. Scramble together the egg, milk, cinnamon and optional honey/syrup. Add bread and allow to soak up the liquid. In a pan heated to medium low, melt the butter and then add the toast. Cover. Cook until golden browned on each side, flipping once. Serve warm. Cold weather has you stuck inside? 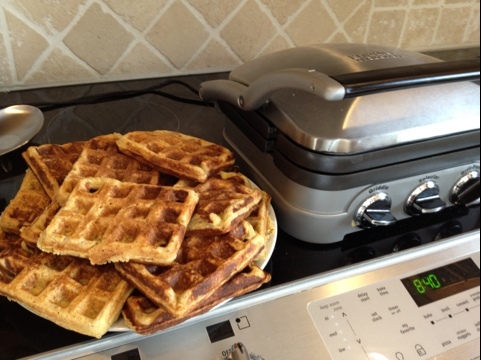 Try making your own cheese on the warm stovetop and transform the extra into waffles! The waffle recipe was adapted from Williams-Sonoma and the supplies for the homemade ricotta, which is surprisingly easy to make, can be purchased from the New England Cheese Making Supply Company for the cultures. Just add local milk, but be sure to use unpasteurized or regular pasteurized because the ultra-pasteurized won’t curd properly. Make extra and freeze them and then all you need to do is pop them in the toaster for a fast, nutritious breakfast. Whisk the wet ingredients together and then stir in the dry. Cook in a waffle iron. I confess that I can’t stand gadgets in the kitchen that don’t do much (read here – like waffle irons). Yet, I actually do like my Cuisinart Griddler because it has removable plates that are dishwasher safe and can be swapped out for a panini press, grill, waffle iron, and I think a few more that I don’t own. Easy to clean and does a lot for a relatively small amount of storage space.